The term of ancient Asuka Period began in 592 and ended in 710. “Asuka” is the southern area of Nara Prefecture. In this period, Buddhism was the most essencial things of the culture. With Buddha statue, the religion had already came to Japan in the middle of 6th. And the two powerful family, Soga clan（蘇我氏） and Mononobe clan（物部氏） fought with each other whether accepting it or not. Shotoku Taishi（聖徳太子） and Soga clan supported Buddhism and Mononobe clan was opposed to. In 587, when Shotoku Taishi was therteen years old, he and Soga clan beat Mononobe clan. It directed Japan as the Buddhist country at Asuka region . From the view point of the feature, the culture of Asuka Period is divided into Asuka Culture(飛鳥文化) and Hakuho Culture（白鳳文化）. And both of them really showed the characteristic of buddha art. Asuka Culture was very local culture of the region. Because the culture was deeply affected by the people who came from Korean Peninsula and settled down in the capital. They introduced not only the culture of Korean Peninsula, but also of China in the Period of North and South Dynasties, India, West Asia, and Greece. The great statue of Buddha at Asuka-dera is older than any other Buddha statues in Japan. It was said that Shotoku Taishi hope the plan and Horyuji Temple（法隆寺） was founded in 607. 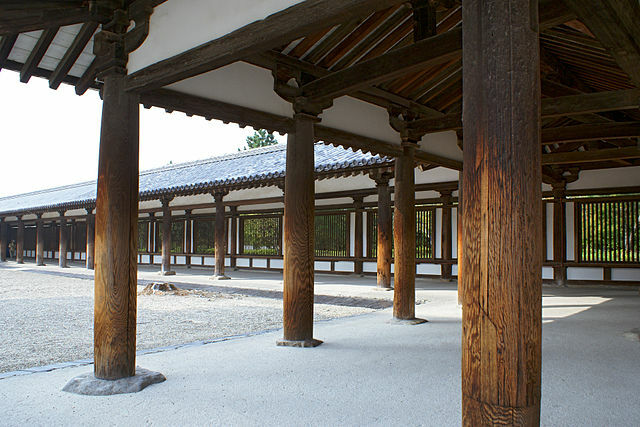 Saiin garan of Horyuji is the oldest wooden structure be in existence in the world. Shitennoji Temple is also seen as the plan of Shotoku Taishi. When you walk through the Kairo(corridor) of Horyuji Temple, you can see the influence from the ancient Greece. The pillars of Horyuji Temple shape swollen at the middle. It is thought of as “entasis” which is seen in Parthenon. You can feel the atmosphere of the ancient Greece at the Buddha statues of Asuka Period. They show very faint smiles at the corner of their mouths including Shaka Nyorai at Asuka-dera, Kudara Kannonzo at Horyuji, and Miroku Bosatsu at Chuguji and Koryuji. It is called “archaic smile” and one of the features of the ancient Greece sculptures. (learning about Buddha statue in Japan) And the Agency for Cultural Affairs esignated Kudara Kannonzo as a first national treasure in Japan. Most of the paintings and craft arts of the Asuka Culture also are based on Buddhism. “Tamamushi-no zushi”（玉虫厨子）, The Jewel Beetle small Shrine, one of is the masterpiece of the culture. The main Buddha statue in the Tamamushi-no zushi and its gorgeousness was lost through the years. But the lacquered door and the pictures were still well remained. The pictures have depicted the world of Buddhism. 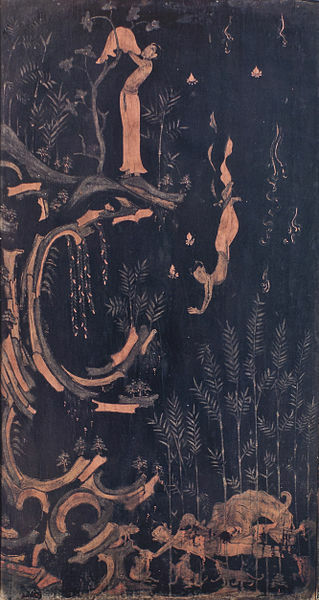 “Shasinsiko-zu”（捨身飼虎図） was the scene that Buddha’s previous life throws himself from the cliff and become the feed for the hunger family of tigers. The terms of Hakuho Culture was from Taika Reform in 645, to the relocation of the capital to Heijokyo in 710(start of Nara Period). At that time, Japan just followed the political system of , as well as the culture of, Tang dynasty of China. The air of the Hakuho Culture is “generosity”. The government had aggressively founded many temples in the term. But the three-storied pagoda of Yakusjiji Temple is the only remaining structure in Hakuho Period. With the three eaves, it may be seen as the six-storied pagoda. An American scholar of Eastern art, Ernest Francisco Fenollosa praised the beauty as “frozen music”. The Buddha statues of the Hakuho Culture are plumper and natural, without archaic smiles. Yakushi Nyorai（薬師如来), Nikko Bosatsu（日光菩薩） and Gakko Bosatsu(月光菩薩） at Yakushiji Temple show the dynamic shapes. Also, Yume-chigai-Kannon-zo（夢違観音像） at Horyuji Temple and Buddha’s head at Kofukuji Temple are famous. The peak period of constructing the “Kofun”（古墳）, tumuluses, for the people in power was already passed. The Takamatsuzuka Kofun（高松塚古墳） was built in the end of its history. In 1972, Kashihara Archaeological Research Institute investigated the inside. What they looked in the burial chamber were the colored wall paintings. That depicted the people and the four orientation god(Suzaku, Genbu, Seiryu, and Byakko). Speaking of a wall painting, the Kondo(golden hall) of Horyuji hold popular one. It is the picture of the Buddhism in detail. But the fire took place at the Kondo in 1949, and the part of the painting was lost. In Hakuho Culture, the Emperors and the nobles composed Chinese poetry（漢詩） and Waka（和歌）. Otomo-no Oji（大友皇子） and Otsu-no Miko（大津皇子) are famous for Chinese poetry. On the other hand, Emperor Tenji（天智天皇）, Emperor Tenmu（天武天皇), Nukata-no Ookimi（額田王), and Kakinomoto-no Hitomaro（柿本人麻呂) are known as one of the predominant poets. Webster’s bibliographic and event-based timelines are comprehensive in scope, covering virtually all topics, geographic locations and people. They do so from a linguistic point of view, and in the case of this book, the focus is on “Asuka,” including when used in literature (e.g. all authors that might have Asuka in their name). As such, this book represents the largest compilation of timeline events associated with Asuka when it is used in proper noun form. Webster’s timelines cover bibliographic citations, patented inventions, as well as non-conventional and alternative meanings which capture ambiguities in usage. These furthermore cover all parts of speech (possessive, institutional usage, geographic usage) and contexts, including pop culture, the arts, social sciences (linguistics, history, geography, economics, sociology, political science), business, computer science, literature, law, medicine, psychology, mathematics, chemistry, physics, biology and other physical sciences. This “data dump” results in a comprehensive set of entries for a bibliographic and/or event-based timeline on the proper name Asuka, since editorial decisions to include or exclude events is purely a linguistic process. The resulting entries are used under license or with permission, used under “fair use” conditions, used in agreement with the original authors, or are in the public domain. This entry was posted in Period of Japanese History and tagged Asuka Period, Buddha statue, Buddhism, Horyuji, japanese paintings, pagoda, poetry, temple, the Great Buddha statue, Yakushiji. Bookmark the permalink.